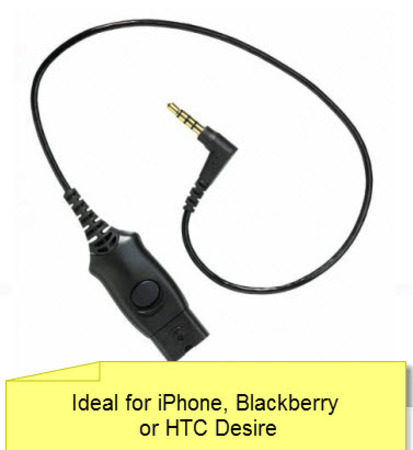 Now you can use a professional, business quality headset with your Apple iPhone, Blackberry & HTC smart phones. This 46cm (18 inch) cable is used to connect any Plantronics H or HW series headset to your smart phone. If you need longer length, add extra length with a Plantronics "Lightweight" Extension Cable - 3 metre (10ft). Calls with be clearer and you will enjoy the comfort of Plantronics headsets. You can even have a great noise cancelling headset and run your business with a smart phone during the day as well as using it for personnel purposes at other times. When changing your mobile phone, just exchange the bottom cable accordingly. You don’t need to exchange your headset. Connects to any Plantronics telecom headset with an Easy Disconnect connection.